Our hope is that these resources will help you grow in your love of God as you gain knowledge of Him through Bible study and prayer. Remember that nothing can replace his Word - not your friend's advice, your mother-in-law's opinion, the cool, new book, or even what we say here at Risen Motherhood. We desire to see all moms studying the word on their own to learn first-hand about the love of God and his design for their lives. We hope these tools will be one part of your toolbox to help you do just that. Print in full color or b&w on your home printer or copy shop. 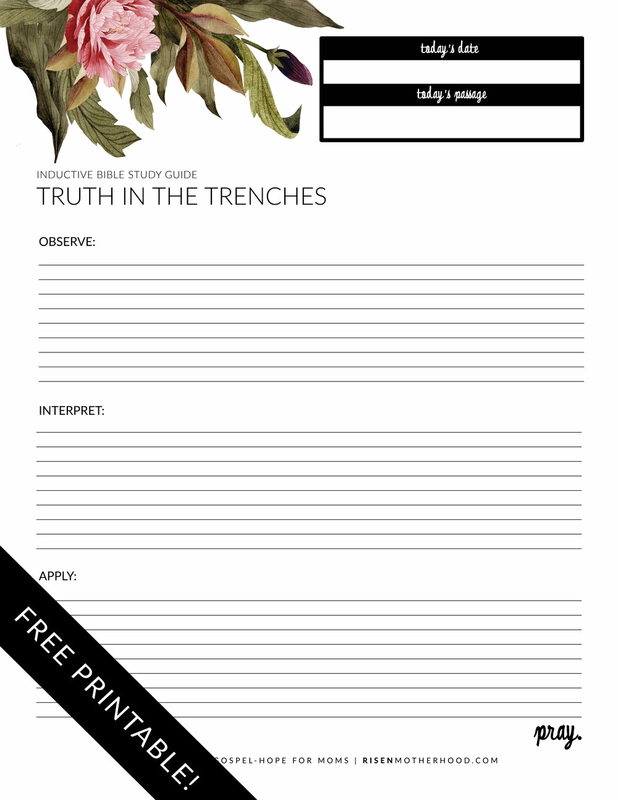 >>> This is the same worksheet as above, just without the floral motif. When you study the Bible with The Abide Method, you study a passage of scripture and seek to understand its original meaning in context before you decide what it means and how to apply it to your life. >>> This is a great worksheet for the beginner. All you have to fill in is the date and passage of scripture you're working on that day (which might just be one verse!) and then use The Abide Method guide your study. Use this version of the card to involve your children in The Abide Method. The front uses simple graphics to signal to your child the step you are working on and the back includes prompts for parents as you walk through a passage of scripture as a family. The Inductive Bible Study method can be used for any age, and this printable will help you scale the method to become age appropriate for your child. The Weekly Prayer Card is designed to help you stay organized and focused in your prayer life. Divided up by days of the week along the top, and categorical prompts along the side, each day you'll pray for a specific request in each topic area that you fill in ahead of time. Print on 8.5x11" paper, we suggest a heavyweight cardstock. These blank cards serve multiple purposes. They're perfect for writing out your current favorite scripture memory verse or writing down additional prayer requests you'd like to keep in mind. You could even try writing out the names of God as you speak prayers of praise, or take time to write out areas of sin you're asking God to work in. Whatever you do with these little cards, we hope you will keep them with you and pull them out often.